Exude poise and grace with this elegant PANDORA pearl solitaire ring, featuring a bold white freshwater pearl atop a simple silver band. Authentic Pandora Sterling Silver small hoop Earrings Retired and htf Great pre-loved condition Please see all pics as they form part of the description Please pay in 2days Please don't buy if you plan not to pay Posted in a bubble envelope and registered only Please leave feedback once received and I will do the same for you Thanks for looking. Stunning Pandora pale pink Pearl and diamond ring in 14ct gold. Authentic pandora 14ct gold blue pearl with a tinge of purple ring excellent pre-loved condition Please see all pics as they form part of the description No scratches or chips on the pearl Its actually is as new condition as haven't worn this gorgeous ring much Please pay in 3 days Please don't buy it you plan not to pay Posted on a parcel post and signed for. Australia only No offers please as won't be answered Please leave feedback once re dived and I will do the same for you Thanks for looking. 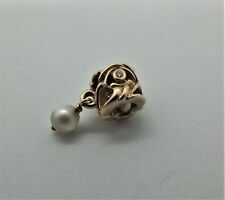 Retired Pandora 14K gold diamond and pearl charm #750460D. Excellent preloved condition, nice and shiny. Genuine Pandora 14ct/14K Gold Daisy Flower Necklace set with a Diamond and Freshwater Pearl. Pandora Model No. 55101D-45 - Retired and Rare. SKU 250408PW. PANDORA Jewellery. New, Genuine & Authentic. We endeavour to provide you with 100% honest information. Ear Nuts / Butterfly Clutches. Ear Threads. Ear Wires / Hooks. Discs / Blanks. Item packed in a genuine Pandora pouch. Gift Box and paper bag not included. Pandora Sterling Silver & Grey Freshwater Pearl Hanging Charm. Can be worn on bracelets & bangles. I have for sale this gorgeous unworn Pandora Radiant Glow Size 60 Ring. This sterling silver ring is set with a stunning pearl and offset with cubic zirconias. It comes in its original box and gift bag. Recommended Retail for this piece is $119. GENUINE PANDORA CELESTIAL MOSIAC CHARM with white mother of pearl and dark black / blue acrylic. PANDORA SALE! SKU 250405P. 14ct Gold & Pearl Compose Ear Pendants / Earring Findings. PANDORA Jewellery. White Freshwater Cultured Pearl. New, Genuine & Authentic. We endeavour to provide you with 100% honest information. 250427P 14ct Yellow Gold. PANDORA SALE! Hanging Pearl Charm Sterling Silver 790208LCZ. 1 x Authentic Retired Pandora Charm to fit Pandora Bracelet. PANDORA SALE! Wishful Thinking. Retired Pandora sterling silver ring with 7 pearls. Hallmarks ?. these usually are sold under the title of ?. and will have varying degrees of imperfection which will be fully disclosed. Retired Gold Pearl & Diamond Pendant, Earrings & Hooks. 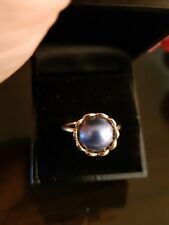 CULTURED PEARL RING SIZE 56. 1 x Authentic Retired Pandora Charm to fit Pandora Bracelet. PANDORA SALE! A gorgeous black mother of pearl heart design adorns this sterling silver charm. Pandora • Fresh Water Cultured Pearl Ring • With Box Condition is Pre-Owned. Sent with Australia Post Standard Service. Stunning pre-owned Authentic PANDORA silver flower & Pearl Ring Size 54. Authentic Pandora Luminous Droplet Ring. 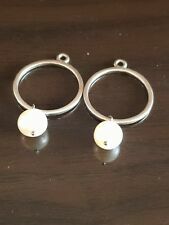 Solid Sterling Silver with white crystal pearl. New and unused. Style Solitaire. Main Stone Crystal Pearl. Ring Size 7.5. Color White. PANDORA | Sterling Silver "Luminous Droplet" White Crystal Pearl Ring(#191010WCP). AUTHENTIC, RARE & RETIRED! 1x Size 60 (#191010WCP-60). Item number 190964P. Authentic Pandora Petite Luminous Leaves Ring. Sterling silver with CZ stones and white pearl. New and unused. Ring Size 8.5. Authentic Pandora Sterling Silver Elegant Beauty Ring. Solid Sterling Silver band with clear cz stones and cultured white pearl New and unused. Main Stone Pearl. Ring Size 6.5. Item number 190964P. Authentic Pandora Petite Luminous Leaves Ring. Sterling silver with CZ stones and white pearl. New and unused. Ring Size 7.5. Authentic Pandora Luminous Florals Ring. Main Stone Mother of Pearl. Solid Sterling Silver ring with mother-of-pearl carved flower stone. New and unused. Ring Size 6.5. Item number 190971P. Sterling silver with CZ stones and white pearl. New and unused. Main Stone Pearl. This ring has been retired. Ring Size 7.5.